-Develop a multi-generational vision for conservation of our region’s natural resources and an action plan for achieving the vision. The 100-year vision will reflect shared goals of local people, conservation organizations, natural resource agencies, and businesses. -Conserve marine shorelines and estuaries. Priorities include protecting additional estuarine acres on Oakland Bay, plus more shoreline in both Thurston and Mason counties. -Conserve wetlands, riparian areas, and associated upland forests. Areas of focus include additional acreage in the Black River, Goldsborough Creek, and Deschutes River watersheds. -Conserve prairies and oak woodlands. Of particular interest are the dwindling prairie resources in Southern Thurston County. -Conserve working lands. Desired outcomes include protection of farms and ranches in the Black River and Deschutes watersheds, plus protection of working forests that provide wildlife habitat and connectivity between more pristine lands. 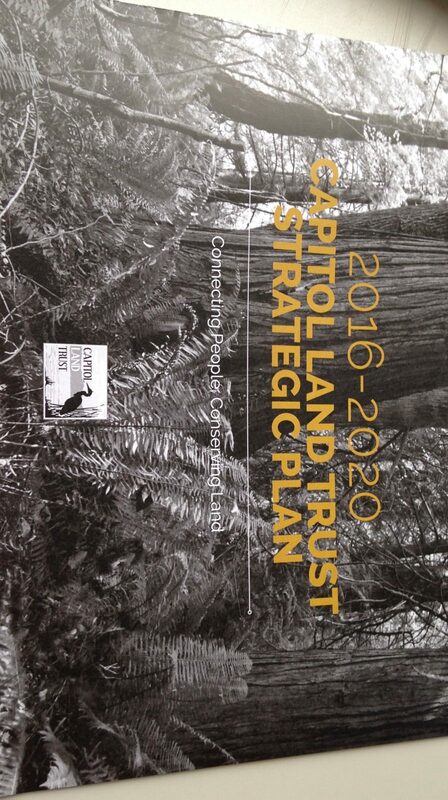 -Ensure stewardship of conserved lands in perpetuity. This strategy focuses on financing, documentation, management plans and best practices, and other legal requirements for long-term stewardship of lands. It also includes significant restoration work on existing protected properties. -Increase community connection and support through engagement with land trust properties and activities. We will work to develop recreational and educational access to conserved properties, where appropriate, and at the same time protect fragile habitat and ecosystems. -Encourage schools and other youth organizations to bring young people to CLT lands where appropriate for environmental education, field trips, work parties, and scientific exploration. -Strengthen partnerships to foster skills and resources that advance our mission. We will connect with community organizations to support conservation, access, and outreach activities on selected properties. -Engage diverse audiences in meaningful dialog to foster a connection to our mission. -Strengthen and diversify fundraising. We will maintain and improve our customary funding sources such as government grants, member donations, sponsorships, and estate gifts. We will also explore new, emerging, innovative approaches to fundraising. -Manage financial assets prudently according to their specific purposes. We will manage our three main funds differently according to their purposes: Endowment, Stewardship, and Rapid Response. The latter allows resilience in the face of unanticipated needs. -Ensure a high level of safety for staff, volunteers, and visitors in all Capitol Land Trust activities. We will continue our current effective practices and give additional attention to safety as more people visit CLT-conserved lands. -Maintain a high quality work environment and retain an excellent staff. We will continue to provide appropriate training, competitive employment benefits and utilize our volunteers effectively. -Ensure strong and functional leadership by our Board of Directors to meet our five-year strategic goals. Our board continues to be highly competent, committed and functional, with a deep knowledge of CLT’s activities. We will focus on board member recruitment and succession, with attention to diversity in gender, education, employment background, skills, community connections, and age. -Maintain Land Trust Alliance accreditation. We will achieve full re-accreditation in 2018.